When the first game in a series is incredible, it sets very high expectations for the next one. Thankfully, Danganronpa 2 takes all expectations brought from it's predecessor and hits them with the hard-hitting visual novel mystery that it does best, with added new features partnered with the best ones from the first one. Delivering the epic battle between hope and despair back once again with just as many passionate and colourful characters as last time, Danganronpa 2 is definitely special in it's own right and is worthy of being part 2 of Danganronpa's thrilling mystery. Giving a new layer to the classic 'stranded on an island' dilemma, 16 students of Hope's Peak Academy find themselves trapped on Jabberwock Island alone with a strange magical rabbit. To begin their school trip gone wrong, the rabbit insists that they must travel the island to collect the Hope Fragments and become friends with one another...that is until Danganronpa's original evil bear Monokuma arrives and takes over, turning it into a tropical killing trip where the students are expected to kill one someone without getting caught. If successful, they can 'graduate', have their classmates punished (killed) and leave the island. If unsuccessful, the killer (known as the blackened) is punished and the rest of the class stays on the island. The story runs over six twist-filled chapters, all compelling enough to have me glued to my PS Vita for about a week straight. The new cast is just as funny and zany as the last, to be expected when the talented cast of characters includes such titles as the Ultimate Team Manager, the Ultimate Yakuza and even the Ultimate Gamer. The characters aren't just amusing though, they're all complex personalities with different backgrounds, therefore reacting in very different ways. Throw in Monokuma and Monomi and you have a cast that perfectly compliments the deep, but cheeky storytelling of the Danganronpa series. 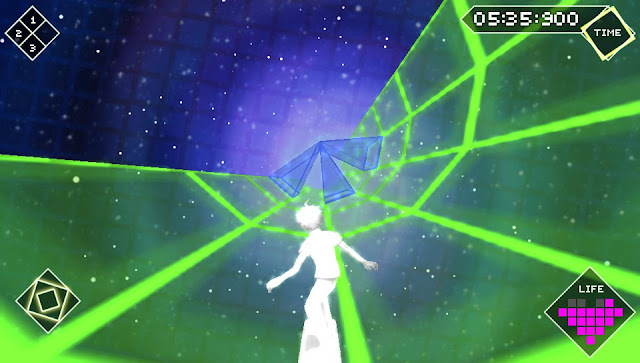 The consistent flow established in the first game continues in Danganronpa 2. Each chapter is divided into two parts, Daily Life and Deadly Life. During Daily Life, the story progresses and you are also given a chance to collect Hope Fragments with your fellow students. Once the story progresses to a climax (when a character has been killed), Deadly Life begins and it's time to Investigate and do a Class Trial to choose who is the blackened. Making friends with characters during Daily Life is encouraged to add more depth to the story, although it can be bittersweet, as you never know if they might be killed by the time it hits Deadly Life. During the Class Trial, the group discusses at length the murder case in an attempt to weed out the blackened. The protagonist must use his Truth Bullets - facts uncovered during the Investigation - to shoot down or support his classmate's arguments. 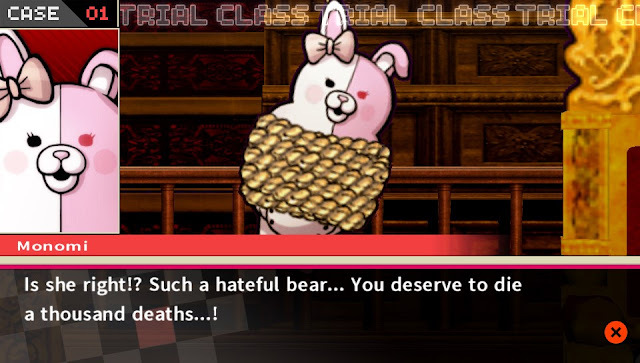 Supporting character arguments during the Non-Stop Debates hasn't been the only thing added to the Class Trial, in fact for better or worse the whole experience has undergone a revamp, along with some new additions. My favourite new additions were Logic Dive, a cool snowboarding mini-game that utilities ramps as choices when thinking out an argument, and Spot Selection, a simple new feature which presents a photo and you must choose the area being discussed or that is a contradiction. On the other hand, the revamped Hangman's Gambit seemed much more complicated than it's original form and Rebuttal Showdown was cool, although my Vita sometimes couldn't handle some of the button mashing required of it. Initially when playing, I found the sheer amount of mechanics needed for the Class Trial overwhelming, but the way they are used add for a nice variation during the trial. Another small, but nice addition is that each trial is split into two parts, meaning it's possible to save partway through, which is appreciated when the length of each Class Trial is considered. Outside of the main story is enough content to put most DLC to shame. 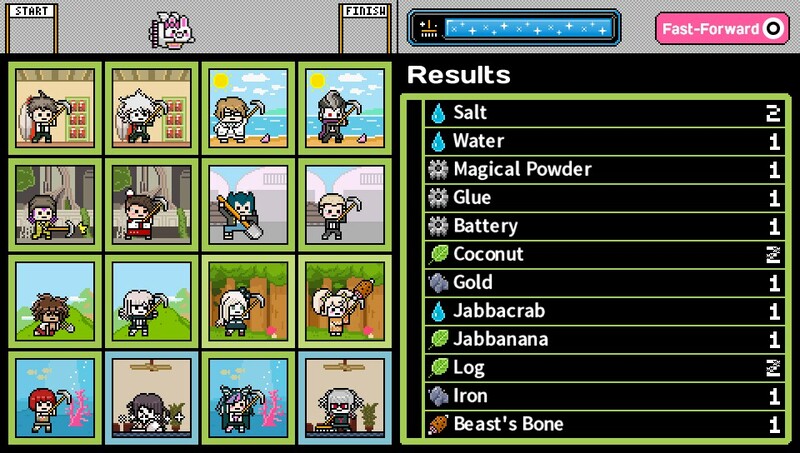 There's Island Mode, an item collection cross social/dating game much like the original Danganronpa's School Mode, Magical Miracle Girl Monomi, a mini-battle game where you can fight small island enemies and Monobeasts, a digital novel called Danganronpa IF covering an alternative story line to the first game, unlockable art and movies and even your own Tamagochi like pet to raise during and after the main story is over. I was overjoyed when these features where unlocked at the end of Chapter 6, as the game had not only left me wanting more, but had willingly given me it. There's also a Japanese voiceover option and in-story collectibles that are also an excuse to playthrough the thrilling story a second time, making Danganronpa 2 highly re-playable even after the 40 hour story. If you loved the first game, Danganronpa 2 does nothing but add to the thrilling story and world from the first game. With many more activities and a gripping story that ties in perfectly to the first one, Dangranronpa 2's mystery kept me coming back for more - and then kept giving me more. If more thrills, chills and kills is what you're looking for in a story, letting yourself become absorbed by Danganronpa 2: Goodbye Despair's many mysteries is completely worth it. A gripping tale and new game mechanics and modes make this game beary, beary good. Danganronpa 2: Goodbye Despair is available now at Play-Asia,net. 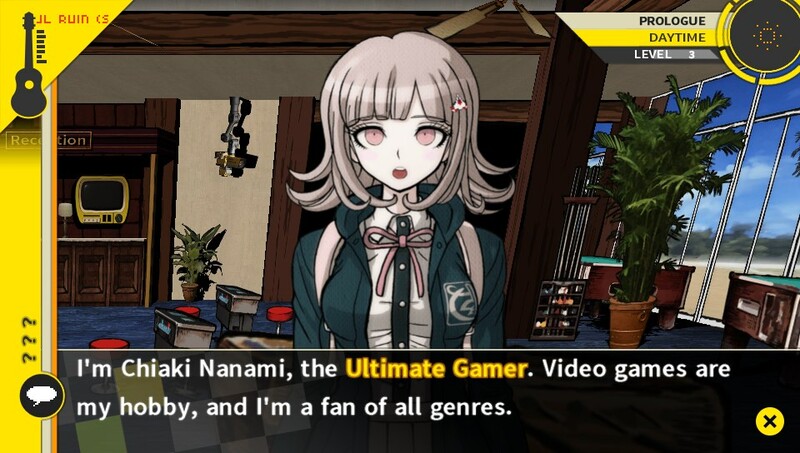 Did you play Danganronpa 2? Are you itching for V3 as much as I am?